HOW DO YOU CLEAN COLORED DIAMONDS? THE CARE AND CLEANING OF FANCY COLORED DIAMONDS! People love colored diamonds (don’t confuse these with real fancy colored diamonds. – and also not to be confused with fancy cut diamonds, which are all the fun shapes of diamonds other than round). People are fascinated by color. The Hope diamond, a blue diamond, draws millions of eyes to the Smithsonian Institute each year just to gawk upon it’s large facets, deep blue luster and it’s magnificent sparkling beauty. But, even with this wonder for exotic diamonds of color (like the great canary yellow diamond) few people will ever own a fancy colored diamond in their lifetime. Popular diamond colors are: Red, Violet, Purple, Green, Blue, Orange, Pink, Yellow, Green-Yellow, Olive, Black, Brown, Gray, and Chameleon. You will find other fun names on the market as well like: champagne colored diamonds and even the new chocolate colored diamonds by LeVian. Sadly, these popular colored diamonds have been heat treated and color enhanced. That’s because a true fancy colored diamond would be very, very expensive. So treated diamonds are the ones you see in stores today. They don’t label them as real “fancy” colored diamonds. And even if you did own a true fancy color, I would make a small wager that the diamond you own is small in carat weight. Because fancy colored diamonds are extremely rare in any good carat weight. Most people will only find a few fancy colored diamonds on the market (like those from James Allen), as opposed to white diamonds. And most people will only be able to afford fancy colored diamonds in sizes like .10 or .20 points. (the norm) They get pretty small and pretty expensive. But here’s a little warning for those few customers that do fall in love with these great colored wonders of man enhanced diamonds… Learn to clean them carefully and cautiously. Colored diamonds have been enhanced by man to maximize their beautiful unique colors and body tones. Suntan anyone? A good portion of gemstones are the same way; emeralds, tanzanite, blue topaz… After all, it’s the rich color that makes any gemstone stand out and get noticed. It’s the truth! color sells. And normally, the darker the better. The good thing is, colored diamonds will keep their beautiful enhanced color for life as long as you don’t subject them to more excessive heat. Heating colored diamonds can actually make that color fade and make your colored diamond appear lighter, pale, and in some cases, even a dull foggy gray. Mmm… not so pretty. Now, when I say ‘heat‘, I’m talking about real heat, like torch heat. Hot, Hot, Hot. And here’s the funny thing: The biggest culprit to harming and fading colored diamonds are actually the jewelers themselves. Jewelers use torches to heat prongs, they do sizings, repairs, settings… They are always putting massive amounts of heat upon those precious treated stones, so the colored diamonds in your rings can take huge doses of heat. Jewelers try to keep their torches away from these stones directly, they also put putty on the stones to soften the blow, but no matter what, they do get hot. Plus, when they are done with the torch heat, they then subject your jewelry to buffers and heated ultrasonic cleaners that get hot as well. Not good. Don’t forget to mention “It’s a colored diamond” when you take your ring in for a repair, sizing or cleaning. Let them know. The jewelers don’t diamond test every stone. And I wouldn’t expect them to either. It’s your ring, mention it. 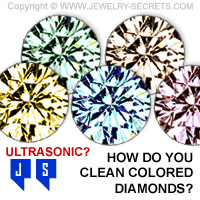 If you tell them beforehand, jewelers will know not to leave that diamond sit in their ultrasonic cleaner for 2 hours and possibly fade your beautiful color. Which brings me to this… How do you clean colored diamonds? Exactly like jewelers do; by hand! Gently wash it with a soft brush, soapy water and a little detergent. A little TLC goes a long way. That’s all you have to say. A little warning will keep your colored diamonds colored. 1 Comment on HOW DO YOU CLEAN COLORED DIAMONDS?